The other day, Josie (Librarian at the U-District Library) asked me to recommend some Manga titles for someone who likes Dragon Ball Z. That got me thinking about how difficult it is to recommend titles. Each Manga series has a complex plot, it’s hard to know what part someone enjoys. 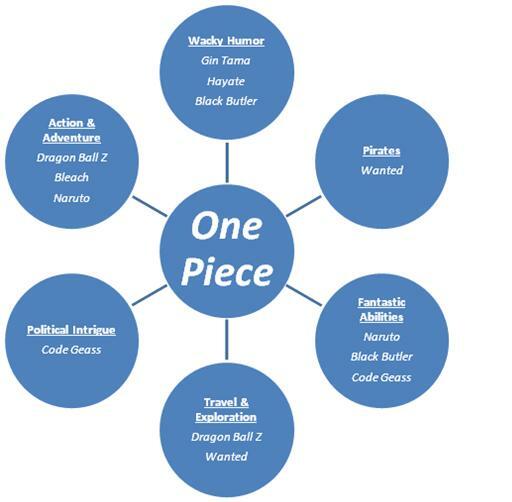 For example, say I had a friend who likes One Piece and wanted to find something similar. I’d have to ask, “What do you like about it?” Do you like action-adventure? Wacky humor? Pirates? Travel and Exploration? Political intrigue? Characters with super abilities? My recommendation would be different based on the answer. If you like action, try Bleach, Naruto and Dragon Ball Z. But DBZ also has travel and exploration, like Wanted. If it’s pirates you like, Wanted is about Armera, a girl who discovers that her kidnapped love has become a pirate captain in the Mediterranean. Maybe it’s wacky humor you like. Then try Gin Tama and Hayate the Combat Butler. Gin Tama is about a team of slackers who work odd jobs and have wacky misadventures in an alternate Tokyo taken over by aliens. Hayate also has wacky adventures, only as a butler and bodyguard to a very wealthy girl in an exclusive upper class high school. If you like characters with fantastic abilities, read Naruto and Black Butler. Black Butler is similar to Hayate, since they’re both very funny and about butlers. Black Butler is slightly more horror oriented, though. If you like political intrigue, mixed in with fantastic abilities, try Code Geass. Code Geass is about an exiled prince on a future Earth fighting the usurpers. Oh, and he has mind control powers, too. Pretty confusing, right? So, I made this chart to explain it better. This entry was posted in Anime & Manga, Book Lists, Comics, Opinions, Read This!, Teen Powered and tagged Book Reviews, Toshokan Otaku, written by teens on November 19, 2010 by Teen Blogger. I agree, Oliver would make an awesome librarian!!! !